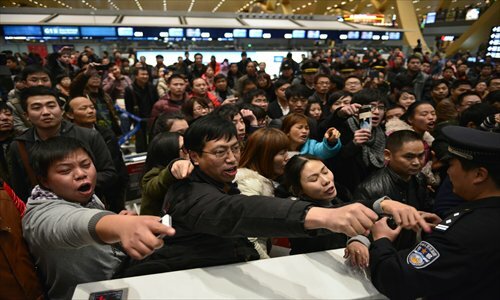 Some 10,000 furious airline passengers in Kunming, Yunnan Province, where flights were delayed Thursday by heavy fog, smashed check-in counters, fought with ground crew and vented their anger on the airport's broadcast system. Flights resumed Friday but the backlog continued into Saturday at the Changshui International Airport in Kunming, after 440 flights had been grounded by weather on Thursday. Passengers scolded the airlines for failing to provide timely flight information. They were also upset with the airport for not providing enough hot water and heat. According to the China National Radio (CNR), passengers waited hours without being told the status of their flights and some airline websites crashed due to a huge increase in the number of requests for information. Li Mingxia told the Global Times her Thursday flight from Kunming to Beijing was canceled and her rescheduled flight on Friday was delayed six hours. Most infuriating, she said, was the lack of information. "I arrived there about 1 pm Friday, shortly before the scheduled departure time, and there was no information about the flight. My flight took off after 7 pm but the information screen continued to show the flight was on schedule," said Li. Some ground crew and passengers got into altercations and local police were called in to restore order. A journalist from the Kunming-based newspaper Yunnan Daily, who declined to be named, confirmed to the Global Times that the airport, which went into operation just six months ago, was short of ground crew and not equipped with enough support facilities. "There is no large hotel close to the airport so stranded passengers are sent back downtown, 30 kilometers away. When passengers complained about the low temperature inside the airport, they were told that the heating system was not fully operational." CNR's report said some passengers began to lose control on Thursday night. "These passengers' actions were radical, and violated laws," Zhang Qihuai, a researcher from the Institute of Air and Space Law under the China University of Political Science and Law, told the Global Times. "The main cause of their extreme behavior was the flawed service provided by the airport," he added. "The extreme weather reveals defects in the management of the civil aviation system," said Zhang, adding that though protected by law, passengers' rights as customers cannot be fully realized when their flights are delayed, as there is no specific regulation detailing compensation. The airport's official Sina Weibo said in a post late Thursday that heavy fog was to blame for the huge number of delayed and canceled flights.